Let your friends guess and share this picture! Welcome back to my video course “250 Dutch Proverbs”. I made a selection of proverbs and sayings that anyone who learns Dutch should know. The course consists of 25 lessons. In each lesson, I explain the meaning of 10 proverbs or sayings. And from this lesson on, I am going to do something new. Kata, one of our students. makes drawings that represent Dutch proverbs. I show you the drawing at the beginning of each lesson. It represents 1 of the 10 proverbs of the lesson. And by the end of the lesson, I show you the drawing again. Your task to guess which proverb it is. Let’s start with lesson 11, containing proverbs 101-110. Literally: mess up a good marriage. Well, the verb “stoken” actually means to put on fire, or to provoke. The expression is used, when there is some successful partnership between two parties, but a third party tries to create troubles within this partnership for its own benefit. Literally: the cards are shuffled. You use this expression on the moment that the main issues are determined. After all, once the cards are shuffled the rest of the game is more or less predetermined. For example you can use it when parties are looking for a compromise; once the headlines are agreed; you can say: “de kaarten zijn geschud”. You can also use it, in a competition, when the score is obvious and there aren’t likely to be any changes in the ranking anymore. For example, if one is ahead 5 minutes in the Tour de France the day before they enter Paris. Literally: if the cat is not at home, the mice will dance. The proverb is almost the same as in English: when the cat’s away the mice will play. This expression is used when the person who is on top in a hierarchy is on a leave, and during that leave the inferiors do not act according their instructions. You can use when children in a classroom are naughty while their teacher is away for a moment. But you can also use it in a professional situation; for example when people come late and go home early when the boss is on a holiday. Literally: he heard the clock strike, but he doesn’t know where the clapper hangs. The meaning is that he has some understanding about it, but actually fails to grasp the full story. It is used typically in a situation when someone claims to know a lot about it, while he actually doesn’t. Literally: it is lead for old iron. These are both materials without too much value, which is approximately the same. If you trade lead for old iron, it is a deal without much sense. So the meaning is: it makes no difference. You can use it when you are comparing options, and you conclude in the end that none of the options is going to help you further. Now, the origin of this expression is the fact that the value of lead and iron has been the same for centuries, at least between the 14th and 17th century. Nowadays lead has a higher value than iron. So the literal meaning is not valid anymore, trading lead for iron today would be indeed profitable! Literally: there is no man over of the ship’s board. In other words, no one has fallen into the water. And you use this expression when you face some bad luck, but actually it is not that bad. A small misfortune, that may give some extra work or discomfort, but it is not going to bother you in achieving your goals. Literally: to put words in someone’s mouth. You use the expression when you try to let the other say something, which is closer to your own opinion than his opinion. You can also use it when you tell your interpretation of what the other has said (and probably did not mean it that way). To give an example: if ask your friend Kees, whether he likes Spain, and he says yes. And then you go to your other friend Jan, and you say; well Kees and I would like to go to Spain our annual holiday; don’t you think that’s a good idea? Then in one phrase you put words into the mouth of both other two: Kees because you translated his phrase that he likes Spain, into his preference for holiday this year. And you also put words in the mouth of Jan – by putting pressure (2 against 1) to let him say that he also wants to go to Spain. Literally: to creep through the eye of a needle. The meaning is to have a narrow escape. The origin of this saying is also the bible. When the main gate to Jerusalem was closed at night, there was a smaller gate (which was called the eye of the needle) through which a camel only could go stooped and with its baggage removed. A “paplepel” is a literally a spoon for porridge. So, the translation is: he got it already with the spoon for porridge. The meaning is that you learnt something already at an early age. An English equivalent is to learn it at mother’s knee. The Dutch expression is not only referring to learning it at young age, but also to the environment of a certain family. For example, if your parents play tennis, and are active members of the tennis club. And they took you with them to the tennis club already while you were 2-3 years old. Then – even if you don’t were holding a racket at that age – you still can use the expression. Literally: to play the black Pete to someone. Now you may think, that “black Pete” here is referring to the coloured skin character Zwarte Piet in the Dutch traditional holiday “Sinterklaas”. But this is not true. It is actually referring to a card game. And zwarte piet is another name for the jack of spades (in Dutch: schoppen boer). The idea of the game is that the one who is left with the jack of spades in the end has lost the game, so you always need to get rid of it. In Dutch the games is called: zwartepieten. In Flemish by the way, it is called “Zotje jagen”. This literally means “to hunt for the jester”. Interesting is that the same figure in the card game in English is a servant to the royalty, in Dutch it is a farmer and in Flemish it is a jester. It tells a lot about the different societies. Ok, let’s come back to the meaning: iemand de zwarte piet toespelen, is to say it’s someone’s fault, to blame someone. graphics designer. You can find her contact details on our website and in the description of the video on youtube. She will make drawings for the rest of the 250 proverbs course. Now if you are also a creative person, and you want to contribute in one way or another to the content of learndutch.org and expose your skills to a large audience. Feel free to contact me with your ideas ! So, that’s it for today. Again you know 10 more Dutch proverbs. And when you hear them, I hope you know where the clapper hangs. Do not forget to share this video on social media, and to put thumbs up in YouTube. 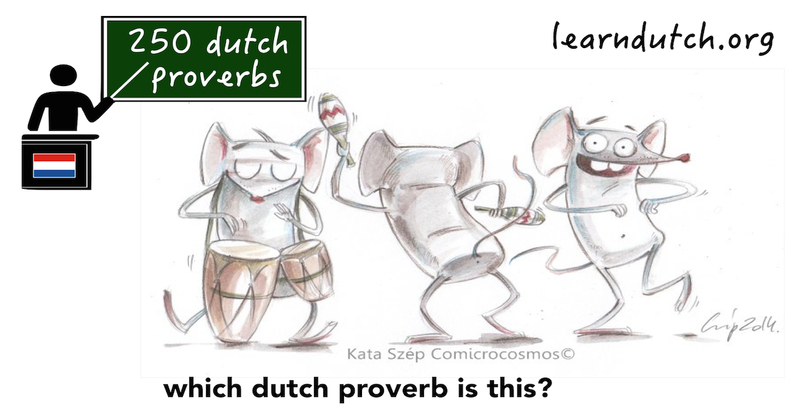 See you back in lesson 12 of 250 Dutch Proverbs.